“What does a comprehensive background investigation consist of?” and/or “What is involved in the background investigation process?” are customary questions repeatedly asked by prospective clients. 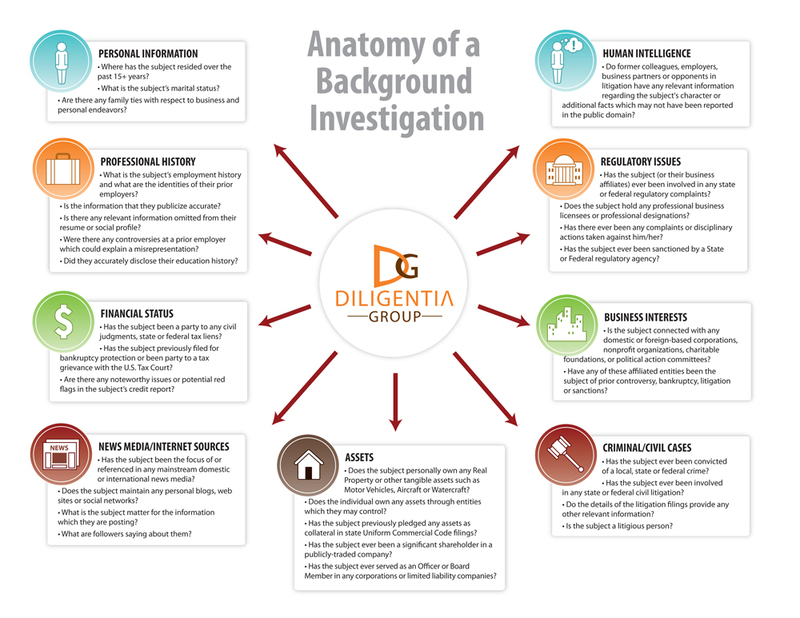 Just as there are typically many ways to perform any given task, the attached infographic and accompanying material below provide insight into a Diligentia Group background investigation to assist clients to understand some of the information that can be identified during the process. ￼What does a comprehensive background investigation consist of? The idea that a professional private investigator can identify anything about anybody, is a long-held myth. The fact is that there is an enormous amount of public records, or “open source” records which an Investigator can uncover which may identify potential “red flags” as to a subject’s personal history, business dealings or financial status (see related post: 5 Myths: What a Private Investigator Cannot (Legally) Get). ￼What “Open Source” Records are Available? So what does it all mean and how does it relate to my problem? The short answer is that the information uncovered may have different effects on different problems. While a convicted felon is typically a significant red flag to any client, a prospective employer may be also concerned about hiring someone for a finance/accounting position with a checkered past such as a bankruptcy filing or finding that a potential senior executive knowingly falsified his/her education credentials.